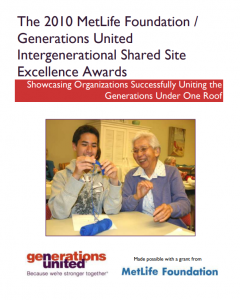 This publication showcases organizations successfully uniting generations under one roof. Intergenerational shared sites are ideal for building bridges between the generations and have been shown to have positive benefits for participants of all ages. Studies show that sharing activities with younger people promotes positive health gains for older adults such as burning more calories due to exercise, sustaining fewer falls, and a reduction in reliance on canes. Adults with dementia or other cognitive impairments experience more positive affect during interactions with children than they do during non-intergenerational activities and these changes last even after the activity ends. Young people benefit from interaction with older adults in numerous ways. Those who become involved in programs gain an enhanced perception of the elderly and of the care required at daycare, senior centers, and nursing homes. They benefit from interpersonal relationships with persons from a different age group, who can provide guidance, wisdom, and support. Many older adults have specific talents to share and can help the young people as mentors, tutors or coaches. Young people can share their skills regarding the use of today‘s technology such as the internet, digital cameras, and advanced cell phone features. Additionally, preschool children involved in intergenerational programs had higher personal/social developmental scores (by 11 months) than preschool children involved in non-intergenerational programs.